We`ve had time to reflect on the phenomenal numbers of moths caught in our traps during last week`s spell of really hot weather, and it`s now back to normal, with numbers at the usual, lesser levels in our traps. 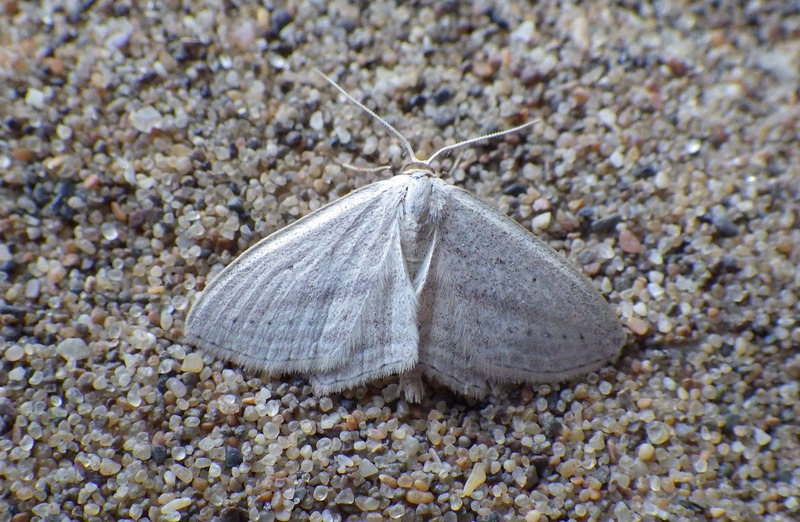 George Tordoff recently provided an useful yardstick when he mentioned how the number of species in his regular Cardiff garden trap dropped from 90-odd species on one of the hot nights to only some 20 or so species (I forget the exact numbers) after the hot episode had broken. 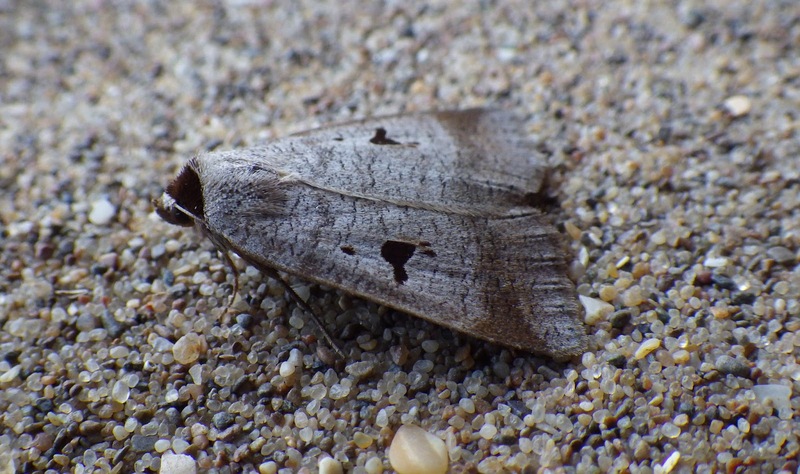 Last night (Sunday, 25/6), I put out the garden trap for the first time since last week`s glorious weather and numbers awaiting me this morning were, in fact, pretty good with July highflyers in quantity, a couple of double lines and yellow-tails as FFYs. I`ve also got a couple of micros to check. 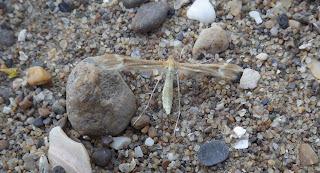 Yesterday evening, almost on a whim, I re-visited the North Dock dune spit/saltings on the Llanelli coast primarily to see whether I could find that little saltmarsh Elasticha that I had caught recently at the Llangennech saltmarshes. Unfortunately, when I arrived at this easy-to-access and convenient site, I noted that my dusking plans might have to change as there was a high tide - and a very high one at that, which covered all of the saltings. Above: looking approximately southwards and seawards towards the Burry Inlet; Gower on the skyline. Thinking that the saltmarsh moths had to go somewhere, I walked parallel to the lapping tide, hoping to flush all sorts of moths, but saw none. 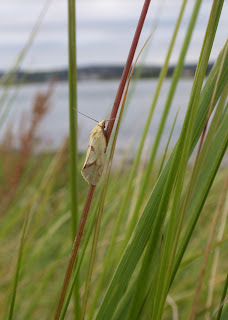 Giving up, I instead checked the dune spit and there was also a paucity of moths there too. Rest-harrow clumps did, however, have lots of the plume Marasmarcha lunaedactyla and I noticed that some had paler (and broader) abdomens - these I presume were the females. The conditions were benign, as the winds had completely abated and it was grey and overcast but not cold. 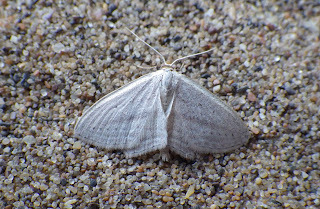 I suspect that I was rather too early for the moths as later, towards c 9.00pm (when I left) there was more moth activity with several common species seen, such as the white plume shown below. 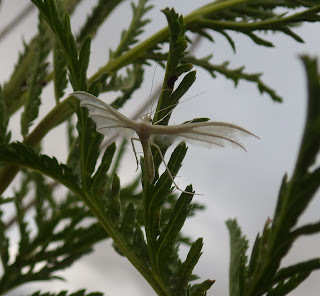 Above: I had to carefully wiggle under a tansy plant to get this skywards shot of a white plume moth Pterophorus pentadactyla. Above: I noticed this resting Agapeta hamana. Above: I also spotted a blackneck lurking in the vegetation, moved it gently to the sandy path and took this photo. As I was departing the site and having a final check of the saltmarsh edge, I flushed a wave that I did not immediately recognise. I swung my net to catch it, but just missed and it dropped into the thick vegetation; I searched the growth carefully but could not find it. It was then I started to have suspicions as to its identity and cursed myself for missing and, `to rub salt into the wound`, another flew by, but it was well out of range and I could not see where it landed. `That`s how mothing goes`, I thought and spent some 10 minutes or so searching for more, but no luck. I then decided to finish and started walking back to the car but, after quite a few metres, saw another and, this time, caught it and potted it up. It was what I`d thought the others to be - a rosy wave! I`d only seen this species once before, when Jon Baker brought one to show Sam and I. That was well over a decade ago when we went on a long-distance `moth jolly` to the inland cliffs at Llyn y Fan Fach. 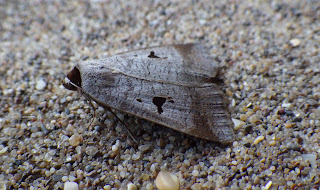 The moth was quite calm, and after taking a few poor-quality, blurry `record shots` in the tube, I took the risk and gingerly placed it on the path for photos. There are previous Carmarthenshire records, made by Barry Stewart in the WWT Penclacwydd area and by Jon at Pembrey Saltings, but the last record was eleven years ago back in 2006 (on 24/6 as it happens). I`m sure that it`s on the Tywi estuary (eg at Morfa-uchaf, or on saltings up-river from Llansteffan) and also on the Taf (eg at Black Scar). 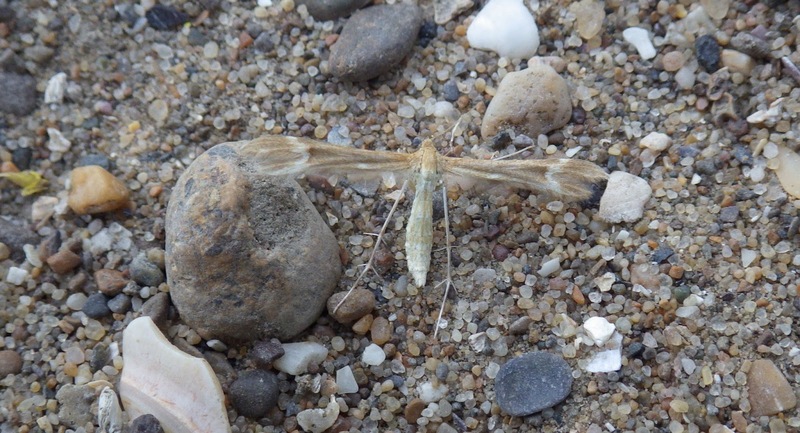 High tides may be useful to push the moth off the saltings into a narrow `catchable zone`. Now is the time to look, especially as the high tides coincide with dusk. Above: `the belle of the ball`, one of the a rosy waves. Incidentally, the head is brown, rather than worn. `Dusking` can be profitable - do try it. Great find! Another species for me to look for on the Cardiff saltmarshes. Well done Ian, your efforts are to be admired. Thanks both. I`ve corrected an error at the start of the 2nd para, where I`d originally given the wrong date.